Posted April 9 · Support within Infill? I´m running into a problem with one of my prints. I got a cube shaped object with two cylinders on the top surface. So in the first layer of the top of the cube it starts by printing the walls of the cube and the walls of the cylinders. Problem is that the cylinders are not supported by the the infill and will therefore print in thin air and fail. Usually I would increase the infill percentage or do an xy offset on the infill pattern. 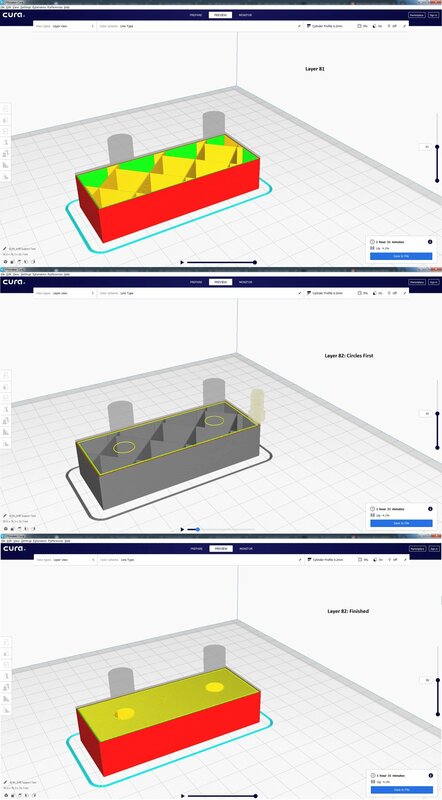 Increasing the infill pattern is not an option bechause this "model" is actually just a small feature in a much larger print (I made a mockup for demonstration in this post). First of all, I dont need a higher infill percentage stability wise. Second: I want to save time and filament and third of all, the print will be used in a very mass sensitive application where I´m trying to shave of every gramm. I also cant use X and Y offset of the infill pattern because other features in the print won´t be supported then. 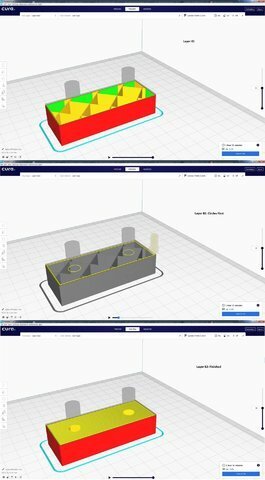 What would you guys recommend, some kind of support within the infill would be the ideal solution I could imagine. 1 - use infill meshes to "beef up" the infill in the critical areas. You can use whatever pattern or density you wish within the infill meshes. I think infill meshes are really good for modifying the infill in specific regions. I use them for reinforcing areas where fasteners pass through the print.